Ralph DeAnna in the studio, painting himself painting in the studio! The 118 Elliot Gallery is pleased to present the exhibition RALPH DeANNA, A REFLECTIVE EYE from Friday, May 5, through Friday, May 19, 2017. The opening reception is during Gallery Walk on Friday, May 5, from 5:30 to 8:30. Gallery hours are otherwise Thursday-Sunday, 2:00-6:00 p.m. and by appointment. Ralph DeAnna, A Reflective Eye is the first one-man show at 118 Elliot Gallery. "DeAnna is that rare painter," said gallery director and curator Lisa Mendelsund, "who is a portraitist and storyteller with an architect's sense of formal perspective." DeAnna will exhibit both large-scale oil paintings and small pastels. In his panoramic paintings, which often include portraits of himself, his models, and their surroundings as reflected and refracted in rear-view mirrors and windows, the viewer can see DeAnna's longtime interest in multiple perspectives and the changeable nature of time and memory. "The Bridge" is a view—rather two views in one—from the Hinsdale side of the Connecticut River. DeAnna, who grew up in Washington, D.C., and studied at the Pennsylvania Academy of Fine Art, has been a painter for over 40 years and a postal carrier in Brattleboro for 27. His steadfast commitment to painting—and his intimacy with the town, its streets and shops—is abundantly evident in his paintings, which are broken up into temporal diptychs or triptychs. These works often feature solitary figures in isolated streetscapes and the nighttime sweep of cars' lights and their motion along roads or over bridges. DeAnna's paintings start from photographs he takes of models posed around town. With expressions of longing, they look in reflective store windows, or, as with the figure in "The Bridge," stand along an expanse of roadway framed by the arching skeleton of the green iron bridge connecting Brattleboro, Vt. to Hinsdale, N.H. This painting is divided in two, bisected by a tree overgrown with ivy. To the left of the tree, the figure is in front of the broad curve of the Connecticut River as seen from Hinsdale, its surface broken by wavy ribbons of late afternoon light; the dark forms of Brattleboro's buildings are seen in the distance. On the right, the same bridge is viewed head-on, some time later, as cars emerge, with headlights aglow, into twilight. Influences in this work include Degas, with his devotion to drawings and sculptures of dancers in motion, and particularly, DeAnna's father. At 17 years of age, Peter DeAnna was the youngest artist hired by the WPA and had to get permission from his mother to travel to North Carolina to paint a mural. He later worked as an illustrator and created realistic dioramas for the Smithsonian Institution. With an emphasis on the fluidity of time and the power of memory, the writings of Proust, too, have been an influence on DeAnna's work. DeAnna has exhibited his paintings at Landmark College, the Brattleboro Museum & Art Center, Vermont Artisan Designs, the Studio Gallery and Parker Gallery in Washington, D.C., and elsewhere. 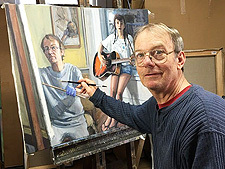 He was a charter member of the former Windham Art Gallery, an artist cooperative, and exhibited his work there for 20 years. The 118 Elliot Gallery, located at 118 Elliot Street in Brattleboro, Vt., is a modern, multipurpose environment for the creative arts, educational talks, and personal events. Art exhibits at 118 Elliot Gallery are curated by director Lisa C. Mendelsund and present a wide array of work from artists throughout the region. For further information, contact Lisa at (802) 257-2757. The next ART TALK is set for Thursday, May 11, at 6:00 p.m., and features LAUREN OLITSKI POSTER, a renowned painter/sculptor, teacher, thinker, and "eye." Speaking on "Structure and Light," the artist traces her creative trajectory from daily interactions with light and form to her studio process, with images shown on the drop-down screen. A group dialogue follows. Admission is $10 at the door.